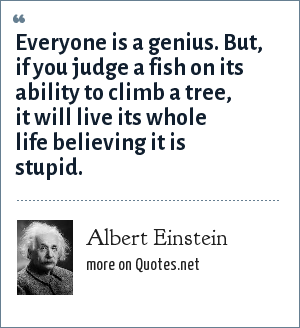 Albert Einstein: Everyone is a genius. But, if you judge a fish on its ability to climb a tree, it will live its whole life believing it is stupid. Albert Einstein was a German-born theoretical physicist who developed the general theory of relativity, one of the two pillars of modern physics. "Albert Einstein Quotes." Quotes.net. STANDS4 LLC, 2019. Web. 24 Apr. 2019. <https://www.quotes.net/quote/73952>.